It took me a bit by surprise that almost all my favorite songs from the first quarter of 2018 have female vocals. Not sure if that says something about this season's music and musicians or my state of mind. Some of the songs are late discoveries of 2017 songs - but most of the music I've only gotten into over the last month. 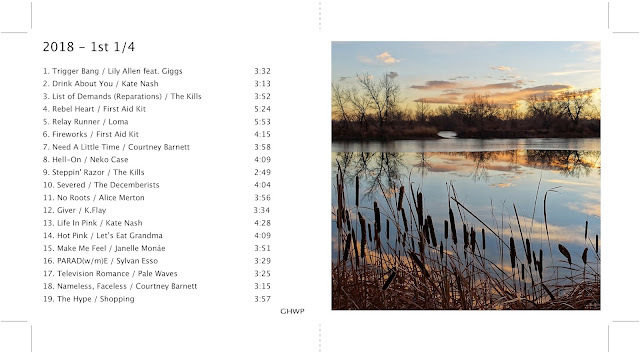 CD cover for the First 1/4 of 2018 Favorites Mix features a photo of a Colorado pond I took in January. Videos for a lot of the songs can be found in my Google+ Music Collection. Listen to all the songs as a playlist on Spotify.